Organizational Systems. Managing Complexity with the Viable System Model. Authors: Raul Espejo & Alfonso Reyes. Espejo and Reyes in this book bring to the reader their academic and consulting experience of many years of working with government offices and with public and private enterprises. The book spells out the practical applications of the Beer’s Viable Systems Model for the analysis and design of organizations. It is a book that carries an outstanding quantity of concepts with practical examples that help the reader to understand the features of VSM. 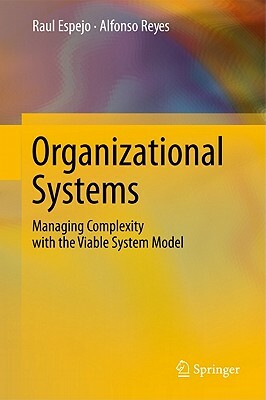 It offers a valid methodology to understand the inner functions of organizations as systems and to deal with organizational and environmental complexity. To the readers who do not know the VSM, the book brings the essentials of the model developing the theoretical framework and methodology. While for those readers who are already familiar with Beer’s VSM the book completes and develops Beer’s approach presenting some valuable insights including interesting considerations about Ashby’s Law of Requisite Variety about the management of variety in organizations, the organizational design and the relevance of redundancy. Moreover the book also introduces the reader to the Viplan methodology as an operative tool for strategic, structural and informational management of organizations. The strong point of this book is that it offers a sound methodology to apply the VSM, completing the work of Beer with practical examples and a solid epistemology to understand and analyze organizations. It is a book of great relevance both for academics and practitioners interested in knowing a valid method to understand and manage organizations. We highly recommend this book to those that may find its content interesting. Raul Espejo is Director of Syncho Ltd. and the World Organization for Systems and Cybernetics and honorary member of Business Systems Laboratory. The main focus of his research activity is organizational cybernetics. He is author of a large number of books and journal articles.. In the 70’s he was operations director of the CyberSyn project in Chile under the scientific direction of Stafford Beer. He was senior lecturer at the University of Aston UK, from 1977 to 1995 and full professor at the University of Lincoln UK, from 1996 to 2002 and visiting professor at several universities worldwide. In 1985 he established Syncho Ltd at the Aston Science Park, Birmingham, UK. With Syncho he has made consulting for a broad range of organizations all over the world. Alfonso Reyes is a physicist and a systems engineer at the “Los Andes” University in Colombia. He holds a PhD in Management Cybernetics from the University of Humberside (UK). He studied and researched as post-doc in organizational learning with Professor Raúl Espejo at the University of Lincoln (UK). He is a former adviser of the Ministry of Justice in Colombia and has been an international consultant on management cybernetics for the Interamerican Development Bank and the Agency for International Development (USA).